Kanger has rolled out a new Aerotank Turbo Clearomizer and it is TOP NOTCH. Not only does it have all the features you've come to love in Kanger AeroTank Clearomizers such as a sturdy steel body and Pyrex tank; it has some new updated features. It is Kangers largest tank clearomizer to date, measuring in at a 6ml capacity. 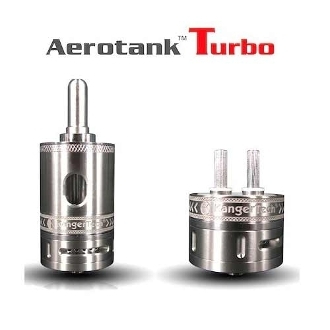 The Kanger Aerotank Turbo Clearomizer also has a built in airflow control. This is implemented to allow you to regulate how much air you are receiving. This is important when it comes to the type of liquid you are using. The thicker the liquid, the more airflow you want to achieve the perfect balance. Along with this, it is a quad coil; which is achieved by using two dual coil heads at once. The Kanger Aerotank Turbo Clearomizer is made for mech mods. Though it will fit on any 510 threaded battery, this larger tank takes more power to function and needs a higher wattage than regular eGo batteries can provide. This is accommodated by one of the mech mods. Unscrew the tank above the arrow printed connection ring and flip over. Fill the tank, being careful to not fill past the connection holes. Also make sure to keep liquid out of the center metal tubes. Replace the base by screwing it back onto the tank. Unscrew the base from the tank. Unscrew each of the two coil heads from the base and replace with fresh ones. **It is recommended to change BOTH coil heads at once to maintain the strength of this powerful clearomizer. When filling your kanger aerotank turbo clearomizer, avoid getting liquid into the metal tube at the center of the tank. If you experience gurgling noises or leaks, this is usually a sign that liquid has ended up in the center metal tube. To rid the tube of liquid without emptying the tank, simply remove the tank from the battery and blow through the mouthpiece. We recommend wrapping a paper towel or cloth around the battery end to catch the displaced liquid. When filling your tank, the coil heads can become lose when unscrewing the base from the tank. Always make sure to tighten the coils heads anytime you remove the base. To maintain a vacuum in the tank and to prevent leaks, try to keep your tank at least 1/3 full whenever possible. The lifespan of the Coil Heads average between 10 to 20 days. They can have a shorter or longer life, depending on thickness of liquid or the amount of vaping.